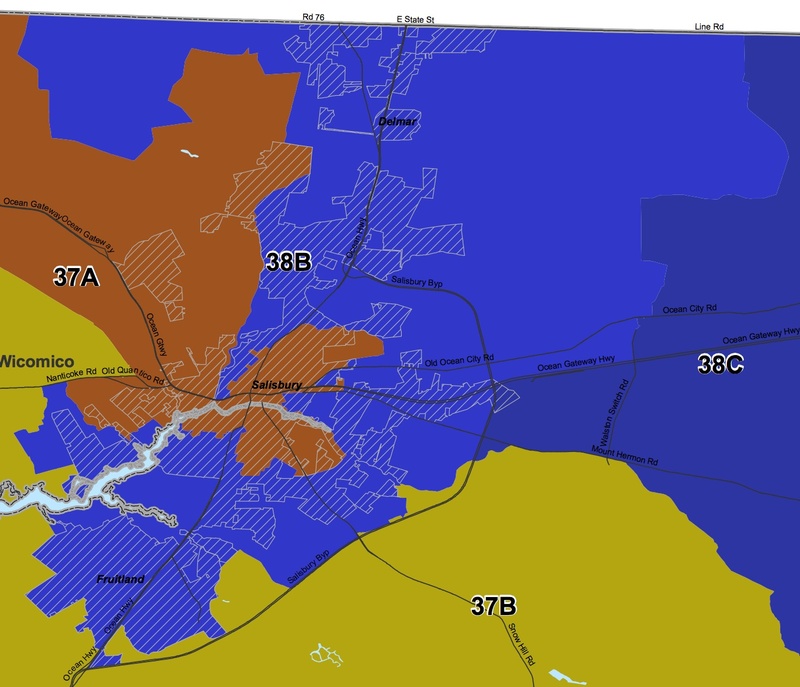 Redistricting has radically reconfigured District 38A. Whereas the previous version included all of Somerset County as well as portions of Wicomico, the new version dropped all of Wicomico but now incorporates all of Worcester’s municipalities–Berlin, Pocomoke City, and Snow Hill–except Ocean City. The trade makes the district much more favorable to the Democrats. The portions of Wicomico lost were mostly Republican. The new sections in Worcester are among the most Democratic areas in that county. As a result, the Democrats have a real shot at taking out incumbent Republican Charles Otto, who was first elected in 2010. His challenger is P.J. Purnell, who was elected to the Crisfield City Council in 2004 and then mayor in 2006. Crisfield, however, is a small town and contains just 8% of 38A’s population. Nonetheless, at 73, Purnell has long roots in the area. Both Otto and Purnell are from Somerset. Making inroads into the new Worcester portions of the district will be critical for both campaigns. In their January filings, Otto had $9K in his campaign account but Purnell did not even file a report. Of course, as a sitting delegate, Otto has not been able to raise funds during the session. The question remains whether Purnell has taken advantage of the time to raise funds needed for his campaign. The old District 38B elected two delegates but has now been divided into two new subdistricts. The new 38B leans Republican but is nonetheless more Democratic than the old version which elected two delegates. 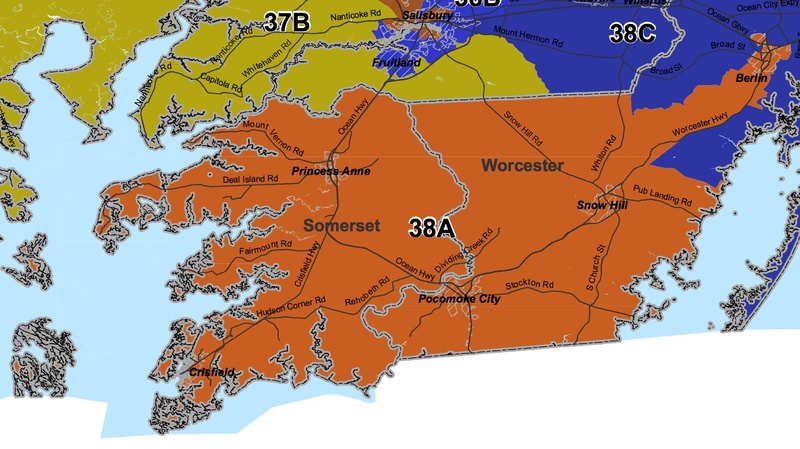 District 38B now encompasses Delmar, Fruitland, and most of the white portions of Salisbury. Fruitland is a bit more Democratic than the areas around it, which have been carefully placed in 37B. The black sections of Salisbury have been included in 37A to facilitate the election of a minority-preferred candidate. The new district should easily reelect powerful Appropriations Chairman Norm Conway who has represented this area since 1987 and came in a strong first in 2010. Del. Conway had a robust $90K in his campaign account and no doubt has the ability to quickly raise more. He has a serious opponent, Delmar Mayor Carl Anderton. But Mayor Anderton had only $2.5K in his campaign account in January, though he could have raised more in the intervening months. And Delmar comprises only 12% of 38B so he will need to work to get known in the rest of the district. General Election Rating: Likely Conway (D). 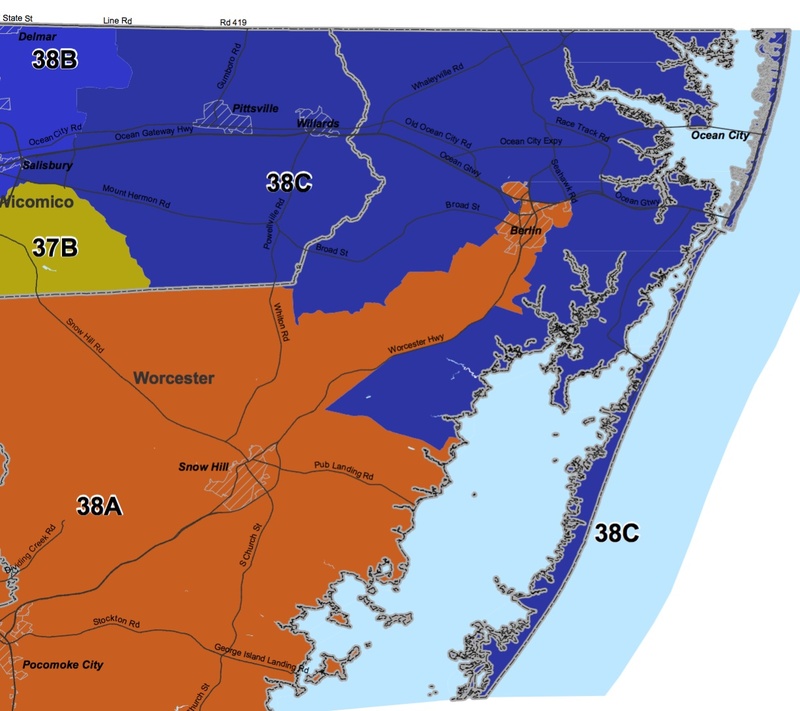 District 38C takes in eastern Wicomico and northern Worcester Counties–the most Republican areas in both counties. The Democrats don’t have much of a prayer here, though two–Judy Davis and Mike Hindi–have filed. Sole Republican Candidate Mary Beth Carozza was Deputy Chief of Staff for Gov. Robert Ehrlich. Democrat Judy Davis, former special education teacher and longtime activist, is not a Shore native but nonetheless has real ties in the area. While someone who knows Shore politics well commends her campaign, she needs more than the $1400 reported in January to mount a serious campaign, especially in a district that is so uphill for her party. Mike Hindi, a lifeguard in Ocean Pines, filed an affidavit attesting that he has raised less than $1K. Don Rumsfeld has regularly held fundraisers for Carozza in St. Michaels. As of January, she had raised $73K and had $51K left in her campaign account. And of course, since she is not a sitting legislator, she has been able to raise more since.